On May 8, the Tehachapi Unified School Board heard from three agencies that proposed ways to assist the district in searching for a superintendent. Cherie Payne, director of human resources for the Kern County Superintendent of Schools, gave a presentation with the lowest bid to assist the district for about $5,000. After more than a three-hour meeting, Tehachapi Unified School District board members appointed an interim superintendent from within the district, while also agreeing to search for a permanent superintendent in the future. They also selected a search firm to help find a permanent superintendent. Paul Kaminski, current principal of Jacobsen Middle School, accepted the position temporarily. He said a contract is still needed, but it would likely extend until June 30, 2019. “My goal is to be very visible to the staff. My job is to serve the board and employees and help in any way I can. 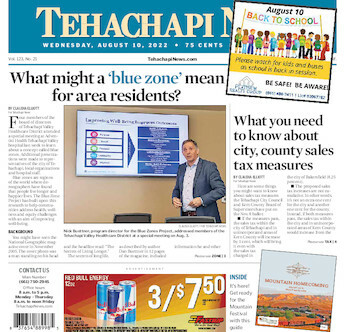 I have the support of many people and want to build on that,” Kaminski said in an interview with Tehachapi News. The only public comment made at the May 8 board meeting was that help should come to the district. “I think we need an interim superintendent now because I feel like our district is not moving forward and we are not going be prepared to be great educators when the year begins," said Tracy Cummingham, speaking as a resident. During the meeting, board members heard presentations from representatives of California School Boards Association, Kern County Superintendent of Schools, and Dave Long and Associates on how they could help the district. The prices for consultation services ranged from $5,000 to $19,000. After a lengthy discussion on whether to save the decision for a later time, the board voted 5-2 to select Dave Long and Associates to provide assistance in starting the process of posting the position of superintendent, beginning the search and interview process. All board members except Mary Graham and Joe Wallek agreed with this decision. Juan Lopez, a representative from Dave Long and Associates, said he recommended that the board start looking immediately for a superintendent, get stakeholders involved in the process, and define the district’s goals on who should be a best fit for the district. Lopez said the company had a high success rate in making sure the superintendent selected by the board was a person who fit the needs of the district and would stay in the position for the long term. This included interviewing candidates for the board and working with the district for up to two years. The estimate for Dave Long and Associates to assist the district in searching for candidates is $13,500 to $14,900. The final amount is to be determined. Some proposals from other search firms did not include interviewing applicants, or working with the district long term.